Perfect cottage for honeymoon or family holidays. Just 1 km from the local village Casole d'elsa. The Olivo Cottage is part of the beautiful framhouse Casa Podere Monti in Casole d'elsa, Siena. Casa Podere Monti is completly family run, and it is our own personal commitment to great care of the estate and the gardens to make this place a special one, not just for us but also for all our visitors. Me ( Federica) and my parents work together to keep Casa Podere Monti at its best and to give our guests a complete assistance during the stay. It is in our choice not to have an official reception office. Maybe you need any assistance? or simply have a question? You can knock at our door of our home. There will be always someone available to help you! The Olivo Cottage has a private location but not far from the main farm, where we live. The concept of a family enviroment is related also to the holiday accommodation: made to be family friendly. The garden is contained and well kept , just the type of place that invites to sit outside to read a book , play games or drink a nice glass of red wine (Chianti of course!). The panoramic pool is set in a short distance from the cottage, so it is close enough reach by foot , but not too close that the fun and laughter will spill over into the garden. The area lends itself to a fun filled family holiday, especially when you are interested about the local culture, traditions and meeting the Tuscans. 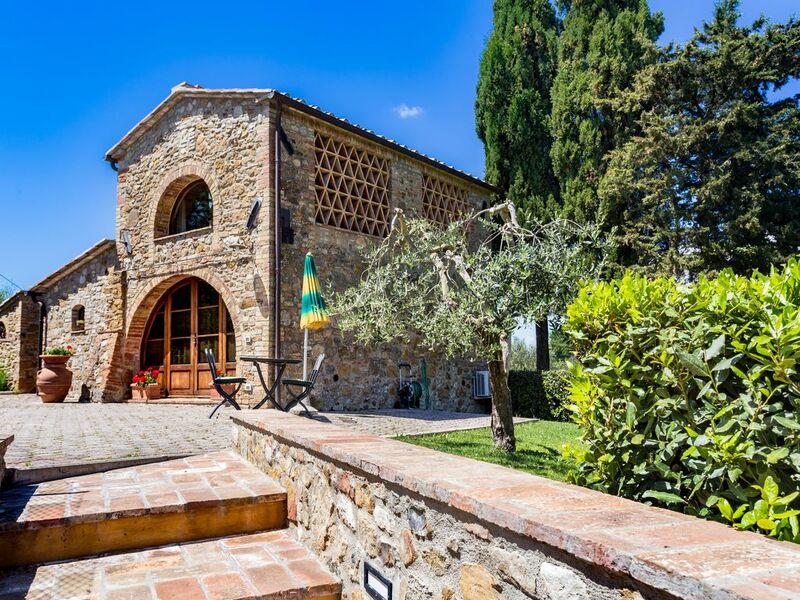 Tuscan Cottage completely renovated with all the comforts of a modern home. The ground floor has a kitchen equipped for self catering with 4 burner gas cooker, oven, toaster, kettle, fridge, freezer, coffee maker and dishwasher. The cute little living room is very bright with large French doors, sofa and satellite TV. The kitchen leads to a secluded terrace at the rear of the building. The master bedroom is furnished in country Tuscan style with en-suite bathroom with shower. Upstairs feature and panoramic attic with 2 single beds and small wardrobe. The attic is opened and bright as well with two large windows and en suite bathroom in Tuscan style. The whole building is surrounded by an enclosed area and gated. The patio in front of the house is equipped with table and chairs to enjoy during the day of spectacular views over the countryside and at night the cool breeze. The swimming pool with panoramic views is equipped with sun loungers, deck chairs and parasols. Wi fi on all outdoor areas. The house Olivo is only 1 km from the nearby town of Casole d'Elsa, also reachable on foot via a scenic path with night lights. In Casole will find small restaurants, grocery stores, cafes, bank and post office . During summer evenings are organized weekly markets and small events starting from 9.00pm. Casole d'elsa is just 1 km from the Holiday House ( there is a well mantained path , illuminated at night) and it is a lovely little town with an exceptionally packed social calendar. You will always find concerts , markets , activities and events that will bring you into the authentic atmosphere. 1.Check-in guaranteed not before than 16.00h and until 18.00h. In case of delay ,please contact previously the Owner. 2.Check out by 9:00 am. 3. It is required a deposit to confirm the reservation . 4. Security deposit request upon arrival 300 euros. 5. Delivery of keys by the owner. INCLUDED IN PRICE: TOWELS AND LINEN WITH CHANGE ONCE A WEEK ( SATURDAY) , WATER,GAS,ELECTRICITY WI-FI CONNECTION AND FINAL CLEANING. NOT INCLUDED IN PRICE: STAY TAX ( 1 EURO PER NIGHT PER PERSON FOR THE FIRST 5 NIGHTS FOR GUESTS OVER 12 ),ADDITIONAL CHANGE OF TOWELS AND LINEN 7 EUROS PER PERSON, MID- CLEANING : 50 EUROS, WASHING MACHINE : 4 EUROS / WASH,BEACH TOWELS 5 EUROS / EACH. PLEASE NOTE : Change of towels and bed-linen is once a week and cleaning of the property is upon departure. The rental cost does not include cleaning during guests stay (example: if you stay two weeks, you will find the cottage spotless upon your arrival, but will not clean a second time at the end of First week). Of course, if necessary, it will perform the second cleaning for an extra charge of € 50.00 and in that second case we will change personally the bedding. Use of swimming pool is included and it is open from April 1st to October 30th. You don’t have to go far to discover the beauty of Tuscany, just 1 km from the gardens of Casa Podere Monti, you will find the charming little town of Casole d’Elsa. You can walk into town after dinner for a delicious gelato or pizza, a leisurely coffee or just to watch the town as it comes alive under the stars. The position of Casa Podere Monti lends itself to visiting all of the monumental sites in Tuscany while still giving you ample time to enjoy the pleasant gardens and refreshing pool at the estate. The city of Siena, with its spectacular cathedral and town square, is an easy drive. You will also find that the road that leads to San Gimignano and Volterra will provide you with lots of new vistas and scenic surprises. Rose fresh ensuite bathroom on ground floor with shower. Romantic ensuite bathroom with old Tuscan style decoration is on first floor with shower. Bright sitting area with sofa and satellite tv. Kitchenette with gas range, ventilated oven, dishwasher, kettle, fridge, refrigerator, espresso coffee and toaster. We are so glad you enjoyed your stay here! Thank you for your kind words for me and my family. It's always so good to know that our guests have understand and apreciated our efforts. We are happy to read that you had the chance to relax and visit our beautiful sourroundings. Perfect stay in the Tuscan Countryside! Excellent Tuscan accommodation, with great Tuscan hospitality! This accommodation is just 5 minutes from Casole d'elsa with splendid views.We keep such good memories on this special holiday and are sure that one of the coming years we will go back there to enjoy the beautifull surroundings of Toscane. thank you from heart for you lovely review from lovely people as you are. For me and My family was a real honor to welcome you here and really really hope it could happen again in the future. We have spent 1 week at Podere Monti . It was very very clean with 2 very large and beautifully appointed bedrooms with bathrooms. The highlight is the terrace,very sunny all day. We have enjoyed it for morning breakfasts and evening dinners. We are glad you enjoyed your stay here. Thank you very much for your beautiful words and compliments. Nice and friendly owners and the cottage is located in a great location near Casole . Out the back windows there are rolling hills and when you walk out the front you have a lovely panoramic patio . Would most definitely recommend this accommodation. We would like to thank you from the bottom of our hearts for such a lovely review. Thank you very much again for being our guests, it would be an honor for us to have you here if you have the chance to travel to Tuscany again. Easy walk to everything. The neighborhood had plenty of little village with lovely restaurants that the locals frequented. Comfortable bedrooms and clean bathrooms. I would recommend to others. First of all we would like to thank you for choosing us. We were there October 16th - 23rd. Weather was warm during the day if it was sunny (T-shirt and shorts compatible for people from the UK, though locals were wearing jumpers, long trousers, boots, body warmers and scarves!) Quite cold over night, so need to take layers of clothing. Need to watch weather forecasts for rain etc and go places where its not going to rain. The property was really nicely finished - good shower rooms, well decorated, clean, comfortable, plenty of hot water, adequate an beautifully clean kitchen. Cable TV was useful - could get BBC News 24 as one of the channels. Would have been improved with an extractor fan in the shower room to get rid of the steamy air - though that wouldnt have mattered in the summer as you could have just left the window open! There were lovely panoramic views over the countryside. The guide-book to local places put together by the owner of the property was very useful and well researched. Note the country roads are a bit slow in Tuscany in general, though google maps seems to get the expected journey times about right. The restaurants in the local town/village of Casole d'Elsa were good. Thank you very much for your kind and detailed review, we are glad you enjoyed your stay here! As you mentioned, the Olivo cottage position is perfect to visit all the beautiful cities of Tuscany : San Gimignano ,Siena, Florence, Volterra, San Gimignano and all the other magnificent places! We are glad to read you appreciated the indoor decorations and the bathrooms. Thank you very much for your words about me. Casole d'elsa is jus 1 km from the house. In the village you can find shops, cafès, restaurants, bank, small supermarket, bakery and several small specialty shops. The village is connected with our holiday home by a safe road, with night lighting and sidewalks. The Cottage Olivo is located very central. It is just half hour from Volterra,San Gimignano,Monteriggioni,Siena and from other lovely little villages. GENERAL INFORMATIONS: 1. Heating : (1.50 Euro / hour) on a pay per use basis 2. Security deposit request upon arrival 300 euros. 3. It is required a deposit to confirm the reservation . 4. Delivery of keys by the owner. 5. Stay tax is paid locally : 1.00 Euro / person for the first 5 nights. 6.Check-in guaranteed not before than 16.00h and until 18.00h. In case of delay ,please contact* previously the Owner : *Tel. number +39 (0) 577 94 86 18 7.Check out by 9:00 am. . INCLUDED IN PRICE: TOWELS AND LINEN WITH CHANGE ONCE A WEEK ( SATURDAY) , WATER,GAS,ELECTRICITY ,WIFI CONNECTION ,FINAL CLEANING AND AIR CONDITIONING. NOT INCLUDED IN PRICE: STAY TAX ( 1 euro per person for the first 5 nights ),ADDITIONAL CHANGE OF TOWELS AND LINEN 7 EUROS PER PERSON, MID- CLEANING : 50 EUROS,BEACH TOWELS 5 EUROS / EACH ( TO REQUEST PREVIOUSLY),WASHING MACHINE : 4 EUROS /WASH.